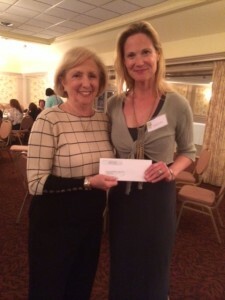 Rachel Focella, a toddler teacher from Horsham Montessori Children’s House was presented with a grant from Kay Lokoff, co-founder of the Terri Lynne Lokoff Child Care Foundation, at their annual broad meeting on May 13, 2015. The Terri Lynne Lokoff Child Care Foundation honors and rewards teachers that are dedicated to excellence, support non-profit and non-sectarian child care centers, provide art and cultural programs to child care centers serving low-income areas and advocate for early care and education every day. We are proud of Rachel for her accomplishments and appreciate her hard work and dedication to the children at Horsham Montessori Children’s House.